M variant of third-generation BMW X5 comes further into focus. We last spied the next-generation BMW X5 M clad in full camouflage. These latest spy shots show the high-performance SUV teasing a lot more sheetmetal, giving us a better look at what BMW has in store for the redesigned model. 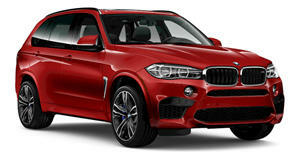 Compared to the new X5, codenamed F15, the M variant sports a more aggressive front end with bigger air intakes, quad exhaust tips, large wheels with signature blue brake calipers gripping cross-drilled rotors, sportier rocker panels, and a lower stance. As per the latest 3 Series, the headlights connect visually to the kidney grilles, while the X5 M will incorporate the same weight-saving technologies set to feature on the 5 Series platform that loosely underpins the new X5. Power will come from the twin-turbo 4.4-liter V8 found in the M5 and M6 with output expected at around the 560-horsepower mark. The new X5 will enter production later this year with the M variant to hit showrooms towards the end of 2014.